Happoone Winter Resort is a ski resort located in Hakuba, Nagano Prefecture. For the 1998 winter Olympic in Nagano, it hosted the alpine skiing downhill, super giant slalom, and cominated slalome eventes. It is considered as the best ski resort in Japan. Located on the top northern side of Happo. It has the best powder snow and it is expert only. 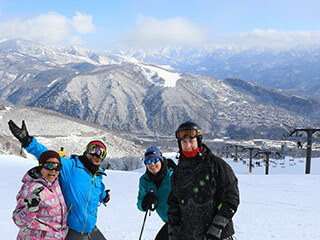 It has a breathtaking view of Japanese Northern Alps and finest powder snow in Nagano. For the expert course because it is the '98 Winter Olympiad Men's Downhill Course. Another Expert course. It was for the '98 Winter Olympiad Women's Downhill Course. It has a great view and for the intermediate to experts. This course has great Panorama view and intermediate and beginners can enjoy. It is 6km long great downhill course. There are many snow board attractions. Expert course with great mouguls. Dynamic Panorama Views of mountains and finest powder snow. Night skiing course. For the intermediate skiers. For the beginners and families. Another beginners course. Sakka is the easiest course in Happo.